Finding Nemo is one of the many beloved Disney family movies. In it, a young clownfish learns that his father's anxieties for him spring from intense love, while his father learns that being too protective can drive away the ones we want most to be close to. As Finding Nemo opens, Marlin the Clownfish (Albert Brooks) and his wife Coral (Elizabeth Perkins) have bought a lovely new anemone on the edge of the reef; the view is ideal, and everything is wonderful for the young couple. They lay their eggs and set about making their new house a home. But the hungry barracuda roaming just off the reef has sinister intentions ... and Coral is killed while trying to protect her eggs. Only one egg survives the barracuda's depredations, and Marlin tenderly cares for it until it hatches. He deeply loves his only son, whom he names Nemo (Alexander Gould). Because his egg was damaged in the barracuda's attack. Nemo has one fin that is slightly smaller than the other, making him prone to swimming off-balance if he's not careful. The handicap makes Marlin somewhat over-protective of Nemo, and Nemo chafes under his dad's smothering care. On the first day of school, Nemo is very excited that he will finally be able to explore with other young fish, away from the constant anxieties of his dad. Marlin is extremely nervous and isn't sure he's ready to let Nemo go. Off the kids go, however, with their teacher, Mr. Ray (Bob Peterson), and Marlin falls into conversation with the other parents. When he discovers that the kids are off to the edge of the reef to learn about the deep ocean, Marlin panics and chases after the school, determined to keep Nemo from harm. Nemo, in the meantime, is revelling in his freedom, and has made new friends. They are hovering at the edge of the reef, daring one another to go out into deeper water towards a boat that they can see, and Nemo is making excuses that his dad wouldn't approve, when Marlin comes barrelling in shouting at Nemo for playing so dangerously. 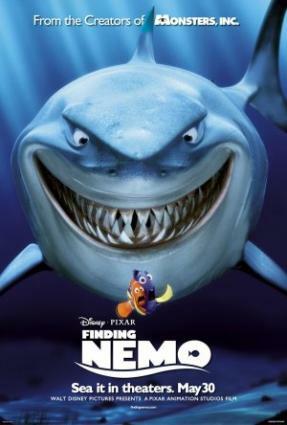 Nemo is angry at being falsely accused, and, in a fit of defiance, swims off as fast as he can toward the boat. He touches the bottom of it with his fin and then swims back toward the reef, half-triumphant at his audacity, and half-terrified at what he dared to do. His father hasn't stopped scolding him since the moment he arrived on the edge of the reef. But, as Nemo gets within a few finstrokes of the reef, a scuba diver appears, bags him, and carries him off. Marlin chases Nemo and the diver, but cannot catch them. He manages to read a bit off of the back of the boat, and is swimming away, disconsolately, when he is run over by Dory (Ellen DeGeneres), an absent-minded blue tang. Dory joins Marlin in his quest to find his son -- much to Marlin's annoyance. But as they travel together, braving the dangers of sharks (vegetarian), surfer turtles, stinging jellyfish, and hungry seagulls, Marlin begins to learn that danger is best faced and out-maneuvered, not hidden from. The story of his journey is spreading throughout the ocean, and he finds many helpful creatures along his way, including a whale who teaches him the value of learning to let go. Nemo is taken to the diver's dental office, where he is destined to be a gift for the dentist's neice, a notorious fish-killer. The other fish in the dentist's aquarium, some of them highly neurotic, initiate Nemo into their "club" and talk him into helping them with their escape plans. Nemo, with his gimpy fin, fails on the first attempt. Then he gets to know the tough Gill (Willem Dafoe), who also has a damaged fin, but who has learned to overcome his handicap. Marlin arrives to find Nemo in a bag, in the hands of the nasty niece, playing dead so that the child will flush him (because all pipes lead to the ocean). Horrified, Marlin returns to the ocean, hardly caring what happens to him. He turns on the ever-buoyant Dory and leaves her stranded in Sydney harbour. 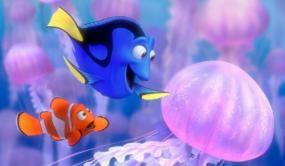 Then Nemo, who has managed to escape, comes across Dory, and she helps reunite him with his father. In the last great danger of the movie, Dory is trapped by a fishing net, and Nemo rushes in to save her, proving to his father that he is capable of great things.